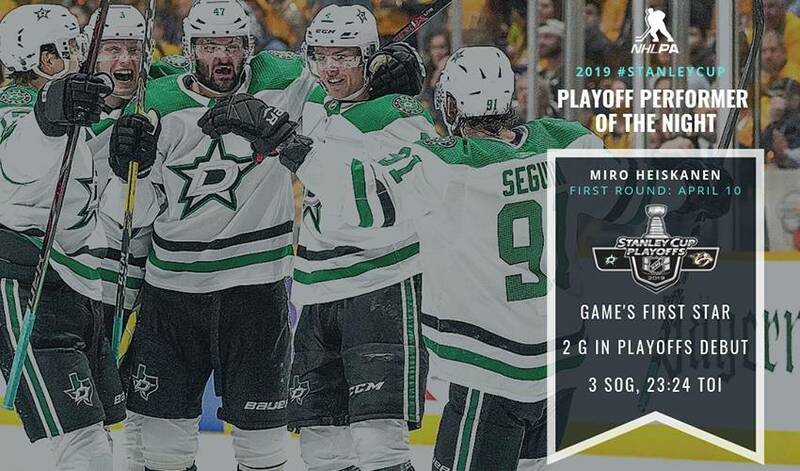 Miro Heiskanen turned in a post-season debut to remember with the Dallas rookie defenceman writing himself into the NHL's record book. NASHVILLE — Miro Heiskanen turned in a post-season debut to remember, even if the Dallas rookie defenceman didn't wind up writing himself into the NHL's record book because of a late scoring change. Heiskanen scored a goal and had an assist, helping the Dallas Stars beat the Nashville Predators 3-2 on Wednesday night in Game 1 of their first-round Western Conference series. An official scoring change Thursday morning gave Heiskanen's second goal to Alexander Radulov for tipping the puck past Nashville goalie Pekka Rinne, turning a historic night for the rookie appearing to become the youngest defenceman in NHL history to score twice in his post-season debut into just a very good game. "I think Rads tipped the other one," Heiskanen said after the game. "I just try to shoot it, shoot at the net." "Just like I've said all year, I'm glad we have him," Montgomery said. Subban pulled the Predators within a goal with 6:36 left in regulation, beating Ben Bishop's glove with a wrister from the right circle. Nashville got a power play with 4:52 remaining, and coach Peter Laviolette pulled goalie Pekka Rinne with 3:13 left. The Predators couldn't force overtime. "We lost our way, we lost the game," Laviolette said. "There's nothing encouraging about tonight. We know we're capable of playing at high speed with high gears and competitiveness. Like I said, it went their way." The Predators came in with much more playoff experience after reaching the 2017 Stanley Cup Final and going a full seven games last spring before losing in the second round. The post-season party started as usual with at least one catfish tossed onto the ice and fans who couldn't get into the sold-out Bridgestone Arena watching outside at the park across the street. This is the first time these Central Division rivals have met in the post-season, timely with Nashville scheduled to play Dallas in the Winter Classic in the Cotton Bowl next season. The Predators came into the playoffs having won five of their last six to win their second straight division title with a win on the final night of the season. Dallas finished 5-1-1 to grab the first wild card in the West for the Stars' first playoff berth since 2016. "Let's not forget how good Bishop was," Montgomery said. "I mean that first period, they controlled every part of the game except for the one power play we had, and Bishop kept us in. It could've been 4-nothing." Nashville forward Brian Boyle, acquired from New Jersey in a trade Feb. 6, sent Stars centre Jason Dickinson to the locker room after a collision about 9 minutes into the first. Dickinson returned in the second. Heiskanen tied it at 12:37 of the second with the puck deflecting off the knee of Predators defenceman Mattias Ekholm. Dallas nearly took the lead off a shot by Roope Hintz with Dickinson following, only to see Rinne stop the puck on the line with the back of his skate 15:00 into the second. The rookie defenceman shot again with Radulov redirecting the puck past Rinne at 6:10 of the third. "What a game," Dallas captain Jamie Benn said of Heiskanen. "The kid comes to play every night, prepares like a true professional, approaches the game like a true professional. He played a pretty damn good game tonight." "This series started, and we got to make sure we are ready for the Game 2," Rinne said. NOTES: Heiskanen set a franchise record with 33 points by a teenage defenceman. He also was one of only three Stars to play all 82 games this season. ... Radek Faska was the last Stars rookie to score a goal in his playoff debut on April 14, 2016, against Minnesota, and Curt Giles was the last Dallas rookie defenceman with a goal in his post-season debut on April 8, 1980, against Toronto. ... The Predators went 35-4-1 this season when scoring first and had been 24-7 all-time when scoring first in the playoffs.